[PDF] Lie Sphere Geometry (IMA Volumes in Mathematics and Its Applications) | Free eBooks Download - EBOOKEE! 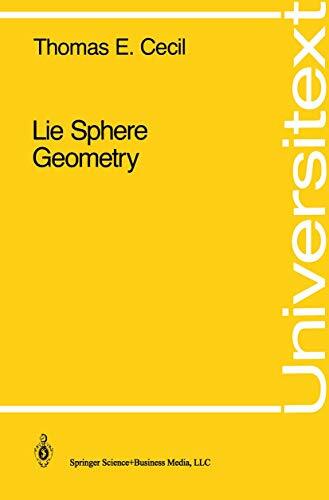 Description: Lie Sphere Geometry provides a modern treatment of Lie's geometry of spheres, its recent applications and the study of Euclidean space. This book begins with Lie's construction of the space of spheres, including the fundamental notions of oriented contact, parabolic pencils of spheres and Lie sphere transformation. The link with Euclidean submanifold theory is established via the Legendre map. This provides a powerful framework for the study of submanifolds, especially those characterized by restrictions on their curvature spheres. Of particular interest are isoparametric, Dupin and taut submanifolds. These have recently been classified up to Lie sphere transformation in certain special cases through the introduction of natural Lie invariants. The author provides complete proofs of these classifications and indicates directions for further research and wider application of these methods. No comments for "[PDF] Lie Sphere Geometry (IMA Volumes in Mathematics and Its Applications)".